In 1932, just one year after starring in his breakout role in Frankenstein, Karloff would don the bandages for another of Universal’s monster movies, The Mummy. Also starring Zita Johann, David Manners, Edward Van Sloan and Arthur Byron. The movie isn’t bad, if a bit slow in parts. It’s said that this is essentially a remake of Dracula but just set in Egypt instead of Transylvania. I can definitely see that what with the parallels in all the characters and how the story is driven forward. And that story is mostly interesting. 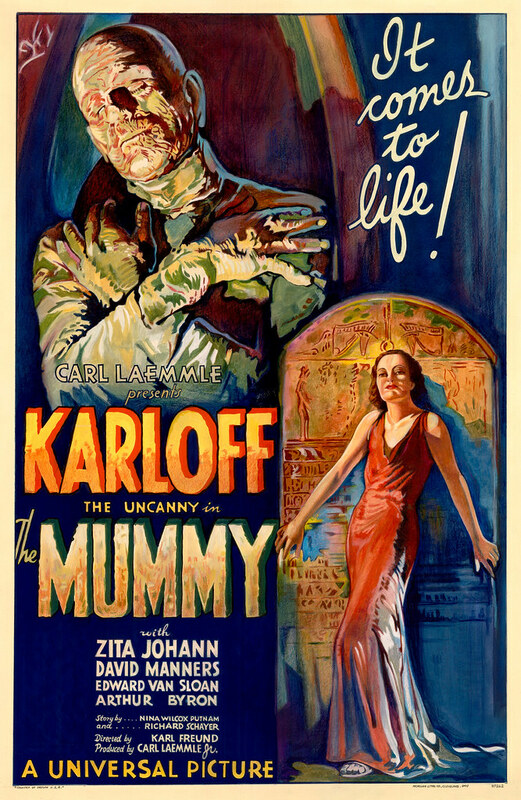 Karloff is great as usual as Imhotep. His female lead, Zita Johann, isn’t great. Even by these 30s monster movies standards. However, for the most part, she gets done what needs to be done. The sets and lighting are pretty awesome. I was constantly impressed by certain props and set pieces that seem to envelope the majority of scenes in the movie. Particularly the scenes with Karloff and Johann at the end of the film. Unlike Dracula (Stoker’s book) and Frankenstein (Shelley’s book), The Mummy joins The Wolf Man and Creature from the Black Lagoon as the only Universal Monster movies not based on a previous work of fiction. However, there are things the script is clearly influenced by like the excavation of King Tut’s tomb in 1922 and Sir Arthur Conan Doyle’s short story The Ring of Thoth. While I liked Dracula a little better, and Frankenstein and the Wolf Man a lot better, this is still a fun monster movie to watch. The movie begins during a dig in an ancient Egyptian tomb. The story makes heavy use of the Scroll of Thoth, which, as I just mentioned, is similar to an artifact in the Sir Arthur Conan Doyle short story, The Ring of Thoth. Of course, the young, impulsive character opens up AND READS FROM the creepy, old scroll that he was told not to touch just five minutes before. And, of course, it awakens The Mummy. Karloff’s makeup, by industry great Jack Pierce, is photographed brilliantly in this movie. Check out Karloff’s crazy undead stare. I just got chills. More awesomely lit Karloff images. He really is pretty great in this movie. Hands down the best thing about it. Followed closely by the lighting, sets and costumes. So that’s Universal’s The Mummy. I enjoyed it, but maybe not as much as I was hoping. This entry was posted on October 4, 2016 at 8:00 am and is filed under Genres, horror, monsters, movies, pop culture with tags AWESOME-tober-fest, AWESOME-tober-fest 2016, Halloween, holiday, monsters, movies, The Mummy, Universal Studios. You can follow any responses to this entry through the RSS 2.0 feed. You can skip to the end and leave a response. Pinging is currently not allowed.